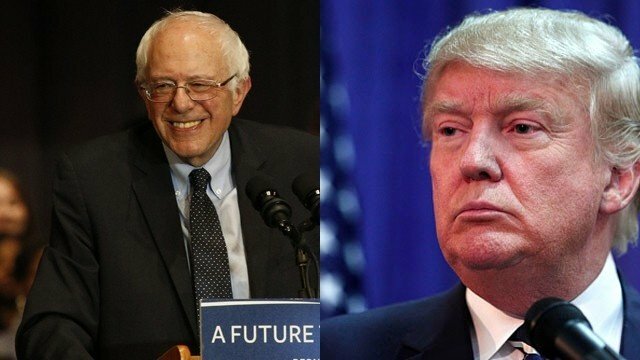 Donald Trump and Bernie Sanders have won the presidential race in the New Hampshire primary. Republican Donald Trump is likely to get more than twice the number of votes of the next Republican candidate. Democrat Bernie Sanders, who beat rival Hillary Clinton by a huge margin, said his victory showed people wanted “real change”. Both candidates are riding on a wave of discontent with mainstream politics. Ohio Governor John Kasich came second in the Republican vote, with former Florida Governor Jeb Bush, Texas Senator Ted Cruz and Florida Senator Marco Rubio all vying for third place. New Hampshire is the second state to choose delegates in the long nomination battle following last week’s Iowa caucuses, which were won by Ted Cruz for the Republicans and Hillary Clinton for the Democrats. The result gives momentum to the winners ahead of the next contests in South Carolina and Nevada. Donald Trump’s lead in New Hampshire is the first time the New York billionaire – who has never held elected office – has translated his widespread support in opinion polls into a victory at the polls. In his victory speech, Donald Trump congratulated Democratic winner Bernie Sanders but sideswiped that “he wants to give away our country, folks!”. Donald Trump, 69, has pledged to deport millions of migrants who are living in the US illegally; build a wall along the border with Mexico; and impose a temporary ban on all Muslims entering the country. With close to 90% of the votes counted, Senator Bernie Sanders has a lead of more than 20 percentage points over Hilton Clinton in the two-horse race for the Democratic nomination. He had topped polls in New Hampshire in recent months, but it is still a significant victory for the self-described Democratic socialist candidate. “What the people here have said is that given the enormous crises facing our country, it is just too late for the same old, same old establishment politics and establishment economics,” Bernie Sanders said in speech to his supporters late on February 9. Bernie Sanders, 74, has vowed to eradicate income inequality, provide free university education and break up big banks. Hillary Clinton congratulated Bernie Sanders, but said in a speech she would continue to fight for every vote in the campaign. Despite the setback, she still remains the frontrunner for the nomination. Hillary Clinton’s campaign manager, Robby Mook, said in a memo that they expected the race for the Democratic nomination “very likely” to be decided in March. The former secretary of state acknowledged before the polls that Bernie Sanders had a natural advantage in New Hampshire because he represents the neighboring state of Vermont as senator. Hillary Clinton, who has more support from the Democratic establishment, narrowly won in Iowa. Most polls in New Hampshire closed at 19:00 local time, with state officials forecasting a historic turnout in the vote. They are the first contests in the US presidential race in which states decide who becomes each party’s official candidate. What Services Can Hospitals Outsource?